Shortlist: BMW F650 Dakar. Suzuki DRZ400S. Yamaha WR250F. KTM 950 Adventure. SOME trail bikes are the biking equivalent of the urban 4x4 car – they were not designed to do any more than look like mudpluggers. But to win an MCN Award you need more than just style – which is why we voted the KTM Adventure winner of this category.
" It’s genuinely great on both the road and mud and has really moved the goalposts for big trail bikes, " said MCN Editor-in-Chief Adam Duckworth. 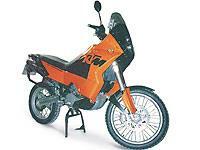 There’s no doubting KTM’s ability to produce quality dirt bikes. Let’s hope it can apply the same skill to its new Super Duke 990 and RC8 road bikes. A video of some of the members of Knobblies Trail Bike Club, both on and off road.